Unless you're a Robert Stack fan, there's little to recommend this period tomfoolery about a young pretender to the throne of King George I. 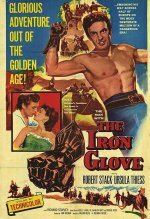 To be fair, Bob swashes a mean buckle; he also gets to romance the lovely Ursula Theiss, who later became Robert Taylor's second wife. The Technicolor's nice, the running time is mercifully short and Alan Hale Jr is on hand to remind audiences of his father, who he so uncannily resembled. The only real surprise here is director William Castle, best remembered for gimmick-strewn horror flicks like The Tingler; he also produced Rosemary's Baby. Stack went on to play Al Capone's nemesis, Eliot Ness, in the TV series The Untouchables.